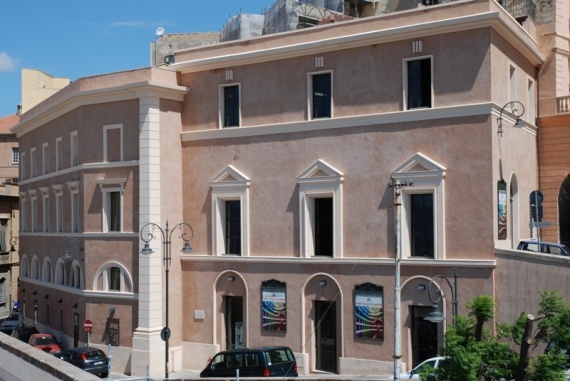 According to the documents, the first theatre in Cagliari was the "University Theatre", a small structure with only thirty loggias and a capacity of about three hundred spectators, built shortly before 1750 at the crossroad between Via Canelles and Via Lamarmora. In 1764, it was demolished and replaced, shortly before 1770, by the “Royal Theatre” built on the initiative of the Baron Zapata. Elegant and with a seating capacity of about 600 spectators, it quickly became the heart of cultural and social life in town. In 1831, by order of King Carlo Felice, it was purchased by the Municipality, renamed "Civic Theatre" and immediately brought back to the top with high level seasons. Starting from 1859, it had a dangerous competitor: the "Diurnal Theatre" (later called "Cerruti"), built in Viale Regina Margherita, at that time an area strongly expanding, with an almost double seating capacity and the possibility to organize all types of shows. The Civic Theatre was essentially an Opera House, that rarely and reluctantly organised other types of shows, including prose. Throughout the long period between 1830 and the beginning of the 20th Century, the prose seasons were only a dozen, and performed by companies less valid than the ones meanwhile working at the Cerruti. In the same period, the Civic Theatre never offered operetta and, due to its small size, could not organise real circus shows but only some illusionism events. In 1897, the Cerruti was substituted by the Politeama, an elegant, vast and multifunctional structure, which started its activity with high profile seasons of opera, operetta and prose. The Politeama competed with the Civic Theatre for the famous tenor Piero Schiavazzi, who was synonymous with a successful season. Due to the evidently unsustainable competition with the Politeama, in 1911 the Municipality, sold the Civic Theatre to the company Cadeddu, that turned it into a cinematograph. It was only under the new management that the Civic Theatre offered some operetta, variety and prose seasons, in addition to the concert seasons started in the early 1920's. The last opera, I quatro rusteghi by Ermanno Wolf Ferrari, was performed in 1939, in the presence of Umberto and Maria Jose of Savoy. On 26th February 1943, during one of the devastating bombings on Cagliari, the Civic Theatre was centered by the bombs. Only the foyer and the perimeter walls survived, and that serious loss took place just a few months after the fire that had already destroyed the Politeama on 17th December 1942. After the recent restoration, accomplished in April 2006, the Civic Theatre has restarted its activities with cultural events, concerts, theatre and cinema.